Pricing: $23 (30 minute lesson) add $4 for travel for lesson at your home. Group fees available. 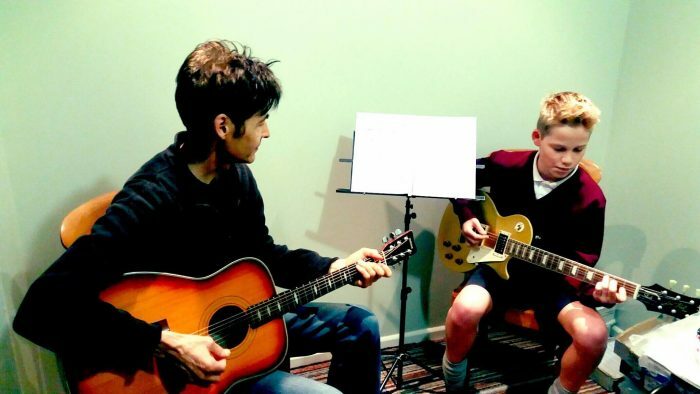 I have always had a great interest in music and started playing guitar at an early age, learning from Clarry Light, Graham Wardrop and various teachers over the years. I explored different instruments including drums, saxophone and bass. I decided my true passion is guitar and 16 years ago I started teaching. My greatest inspiration comes from David Bowie, Cat Stevens, Jimmy Page of Led Zeppelin. I also enjoy playing and singing at open mic venues. * To make my lessons more enjoyable and fun. * To impart my passion to all my students. * I am a very patient person and persevere till my students can play and fully understand music in the lessons. ​* The majority of my teaching is from transcriptions. So right from the first lesson my students play real songs. * I teach in a progressive sequence gradually adding more complex rhythms and chords. After a certain number of songs I give my students more choice and tailor the teaching to suit the artists they like. * Artists that I teach include the Beatles, James Blunt, David Bowie, Michelle Branch, Fleetwood Mac, Nirvana, Kasey Chambers, Dido, Green Day, Jewel, Avril Lavigne, Led Zeppelin, Ed Sheeran, Cat Stevens, Taylor Swift, Shania Twain, and many others. * For more advanced students I identify and target the artists that inspire them and if I don’t have the transcriptions, I find what is available and teach these. * If people want to learn a particular style I will find what is available and teach in addition to transcriptions.